Pears come in two distinct sorts: so-called “European” pears, the familiar sort, and “Asian” pears; the latter are more of a crunchy texture, much like apples. Individual tastes vary, but here we will consider only European pears. A significant factor with fruit is keeping ability. Pears, even the best keepers, are not like apples, some of which can keep—if well-stored—for even up to a year; pears are typically good for, at very best, a few months, and more commonly only weeks. Late-fruiting pears tend to keep longer in proper storage than earlier sorts; some are said to be able to go as long as five months, but a pear type that will last till Christmas is remarkable enough. 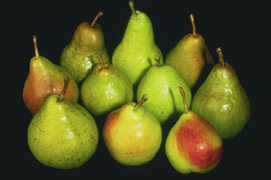 Pears can be kept for a period that varies with the cultivar. For optimum long-term storage, pears should be held right around freezing (which is 32°F) and in 90% to 95% humidity. Note that stored pears (like most tree fruit) give off ethylene gas, which can have a marked adverse effect on many vegetables; so, if you “root cellar” fruits and vegetables, keep your pears (and any other tree fruit) very well away from any stored vegetables, especially potatoes. With pears, another tricky difficulty is the way they ripen: from the inside out, unlike most fruit. The consequence of that is that a pear that reaches apparent ripeness while on the tree is almost certainly already well over-ripe at the core, producing an edible but most unappetizing-looking brown core. The standard approach is to pick pears under-ripe, keep them till needed, then quick-ripen them (which still takes a day or three) prior to use. Some cultivars are a little more forgiving than others about exactly when they are picked, which can be handy. With pears as with apples: because they are grown commercially throughout our region, resistance to diseases and pests—especially, for pears, fireblight—is critical to success. While there are over five thousand pear varieties, only a few cultivars possess both substantial blight resistance and good eating quality. (Fireblight-resistant pear types are sometimes referred to as “Oriental Hybrids”.) You can examine this list of European-type pears (last updated March 10, 2016) to see which types are considered fireblight-resistant. Keep in mind that cultivars once considered “fireblight-resistant”, such as Seckel, are rapidly becoming less so, so don’t rely on this or any older information about blight resistance of types—take such listings as starting-point suggestions. The other desideratum is, as usual in this region, cold-hardiness. There are some pears that look very nice when one first reads up on them, but eventually one discovers that they are best suited for warm climates. Remember that if a fruit tree is of a “low-chill” sort—a measure of how much winter it expects to endure—it will hit its chill hours, think winter must be over, and start putting out blossoms while it is still deadly cold (deadly for fruit blossoms, anyway) outside. There are quite a few pear types that are commonly described as winter-hardy, and a fair few that are said to have moderate to good fire-blight resistance, but the overlap of those two categories is not high. And besides all that, we still have to consider our home-gardener’s basic question: how good does it taste? Because most pears are not self-fertile, we need at least two types, and we further need to check that they are reliable cross-pollinators of each other (not every variety is a good pollinator, and not every pollinator pollinates every other variety equally well—what fun). Be aware that while pear types called “self-pollinating” do produce fruit without a pollinator, even they do substantially better with a pollinator; “partially self-pollinating” is a better description of such types. Unless you are really tight for space (in which case why are you growing a tree at all? ), plant two cross-pollinating types of pear tree. Harrow Sweet: The tree has fire-blight resistance, pear-scab resistance, and psyla resistance, and is reported hardy to at least USDA Zone 4; said to be a heavy producer at a young age (often in the first year, almost always by the second year). The pears, yellow with a red blush, are small-ish, but with an intense, complex flavor, similar to Bartlett and perhaps even better, with a smooth, buttery texture (very low “grit”, a common pear problem). It is a late-season sort (depending on location, usually October), meaning it stores well (typically well into December), and is reliable. Moreover, it can be ripened on the tree, which is not so for most pears (because pears ripen from inside to out, so when the outside shows ripeness, the insides normally have become mush). Shenandoah: First off, this type blossoms at a time close enough to Harrow Sweet that they make a good pollination pairing. It is also another quite fireblight-resistant type. And with all that, it is said to have a fine flavor, being especially tangy (higher than average acid content), and it is quite long-keeping (for a pear: four to five months). It looks like, and many say tastes like, the classic Bartlett pear. Those are definitely not “no-brainer” choices. We think they’re the best for our circumstances (meaning our general region, and most of the northern half of the country), but feel free to look on your own. Just keep firmly in mind those three needs: strong fire-blight resistance; solid cold-hardiness; and pollination qualities (giving and taking, both). OHxF97 : produces a “standard” size tree (recommended spacing is 12’ between trees in the row and 20’ between rows. OHxF87 : produces a “semi-dwarf” size tree; can be planted at 5’ in row and 12-14’ between rows. It is often said that unless pear trees are grafted onto quince rootstock, they will take many, many years to set their first fruit; but many professionals have found quince rootstock for pears unsatisfactory over the long term, and the modern trend is to use a semi-dwarfing rootstock, which promotes not only smaller size but precociousness, cutting (so it seems from the literature) the years to fruit about in half. Pick your nursery and follow their advice (here is a sample). Some sources suggest mulching dwarfing rootstocks to a level above the graft union in winter for protection from severe cold. If you choose to mulch, wait until the ground freezes to apply the mulch, and be sure to pull the mulch away from the trunk again in early spring. The cultivation of pears is very similar to that of apples (see which). There are also some useful links in the list farther below. Those really interested in pears should take a look at The Great Book of Pears by Barbara Flores. Rethinking the chill requirement for pear ripening - handling of pears after picking can be tricky; this report, though aimed at commercial growers, is interesting. Yes, yet another member of the delightful, fruit-rich Rosaceae family, pears come in about 30 species, of which only three are useful for edible fruit: Pyrus communis, the European Pear, cultivated mainly in Europe and North America; P. xbretschneideri, the Chinese white pear (bai li); and P. pyrifolia, the Nashi Pear, more commonly known as the Asian Pear or Apple Pear, the last two being grown mainly in eastern Asia. There are thousands of cultivars of these three species. Like apples, pears are “pomes”, a term that refers to their seed pattern. Pears have been an important fruit for at least seven thousand years. It is recorded that around 5,000 B.C. a Chinese diplomat named Feng Li gave up his career to become an orchardist, growing pears (as well as other fruits). Homer, in the Odyssey, reckoned pears “a gift of the gods.” The ancient Romans, always diligent agriculturists, left many careful records of pear growing and grafting techniques. During the Renaissance, pears were famously standard parts of classic still-life paintings. By the seventeenth century in Europe, what we may call “Modern” pear cultivation was well under way. And, of course, the first day’s Christmas gift was a partridge in a pear tree. Though not so well known as hard apple cider, there is a hard pear drink, commonly called “perry” (not quite the same as pear cider), which is commonest in the U.K. and some northern European nations. There is even a distilled form of perry analogous to applejack. And certain pear cultivars are known as “perry types” (and are not usually good for plain eating). It was last modified on Tuesday, 12 February 2019, at 02:57 EST.